You will need a Lutron Pico wall plate bracket if you'd like to mount a Pico remote control directly to a wall, for an additional point of control when using a Caseta Wireless dimmer. You'll also need a wall plate bracket if you're replacing existing switches in a 3-way application (where lights have 2 or more wall switches) with a Caseta Wireless In-wall dimmer and a Pico remote control. Pico remote control and wall plate sold separately. 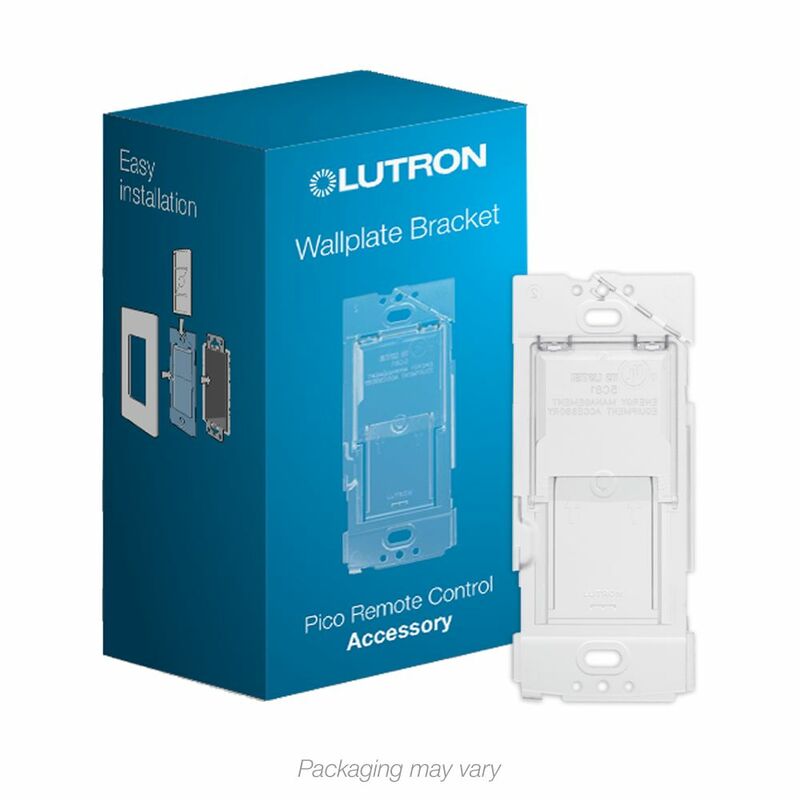 Caseta Wireless Wallplate Bracket for Pico Remote You will need a Lutron Pico wall plate bracket if you'd like to mount a Pico remote control directly to a wall, for an additional point of control when using a Caseta Wireless dimmer. You'll also need a wall plate bracket if you're replacing existing switches in a 3-way application (where lights have 2 or more wall switches) with a Caseta Wireless In-wall dimmer and a Pico remote control. Pico remote control and wall plate sold separately. Caseta Wireless Wallplate Bracket for Pico Remote is rated 4.7 out of 5 by 64. Rated 5 out of 5 by HomeDepotCustomer from This product is amazing! The dimming is extremely precise. I... This product is amazing! The dimming is extremely precise. I can control 1 light separate from others or groups of lighting. Separately. For each switch leg you will need to have a switch. Neutral is not needed to tap to this device. Alexa is awsome with this but Siri works too! App is ez to use! Rated 5 out of 5 by Michael from The conversion to a LED wireless remote system... The conversion to a LED wireless remote system was very beneficial. The small remote was taped to the old larger remote so it wouldn’t be lost easily. Rated 5 out of 5 by Frenchie from Perfect fitting. ... Perfect fitting. Rated 5 out of 5 by Don from Great switch. Easy install and easy setup. ... Great switch. Easy install and easy setup. Rated 5 out of 5 by Fitz from Works well to mount the remote and install for 3-way... Works well to mount the remote and install for 3-way solutions. Has anyone installed this plate beside an existing single switch by sticking this to the wall and installing a double gang cover plate on top? Yes, this is one of the great possibilities of the Caseta Wireless system! You can easily turn a single-gang box into what looks like a multi-gang box by mounting Pico remotes next to them and using a larger wall plate to accommodate. Just make sure to line up your Pico remote/adapter plate with the wall plate before screwing it into your wall. Please feel free to reach out to our Support Team at support@lutron.com or by phone at 1 (844) 588-7661 with any questions/concerns.